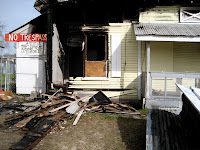 Houston, Texas, U.S. - An early morning fire has burned out Houston's radical anarchist book store, lending library and Indymedia office. 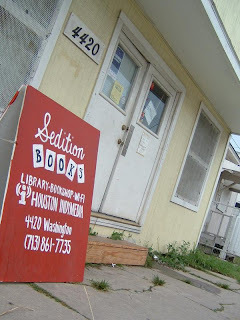 Police say that the blaze that destroyed a portion of Sedition Books, located at 4420 Washington Avenue, was almost definitely set intentionally because is originated outside but their investigation has not been completed. One police officer suggested that the store operators who lived on the premise were asking for it by having politics that are "too extreme." Fortunately none of the building's occupants were injured. There doesn't seem to be a shortage of suspects. The store's operators believe that the fire could have been started by local Ku Klux Klansmen, neo-Nazi skinheads, the agent of a developer or even a disgruntled former customer. The fire department arrived promptly and many of the books and computer equipment was able to be salvaged. Collective members vow that they will be back in business in the next one to five months and have solicited donations from their supporters to help them achieve this goal.